Ever wanted to send push notifications to your customers based on which product they are looking at or where they are from? We have the perfect integration to help you target specific customers while they are on your site. With this integration between Fera and PushOwl, you can set up automated campaigns based on the behavior of your customers. Activity by your shoppers is tracked in real time and this will trigger notifications based on the conditions you have set up. 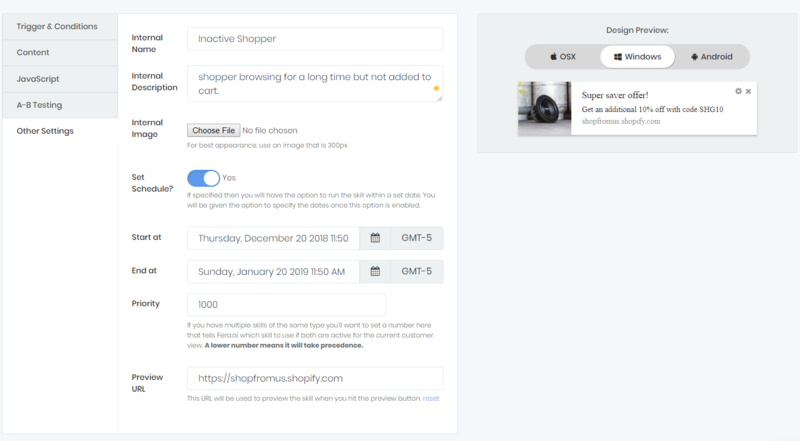 With this powerful feature, you can send notifications to shoppers who have items in their cart, shoppers who have been browsing on your store for a while but haven’t purchased yet, and several other conditions. 1. Install Fera on your Shopify store. 2. Open the Fera dashboard. 4. Select 'Custom Skill' to find a set of skills you can choose from. 5. Click 'Push Notification'. 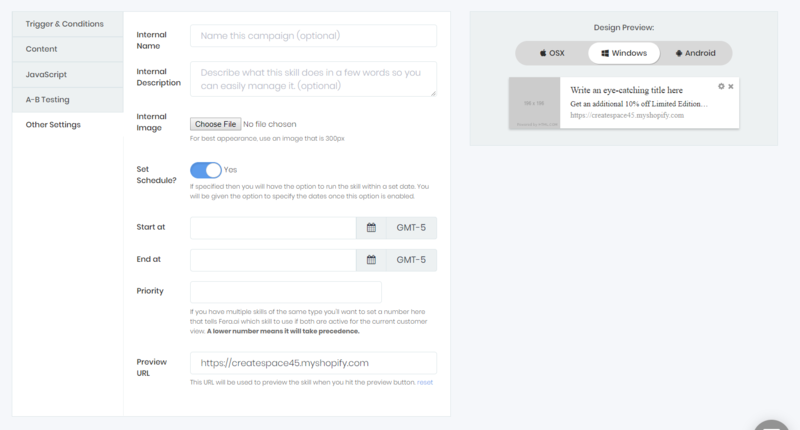 Here, you can set the different settings for your trigger campaigns. 6. Here, you can set the different conditions and create trigger campaigns. 7. Fill in the details of the campaign- ‘Triggers & Conditions’, ‘Content’ and the rest of the tabs. 8. Once you are done, click on ‘Save and Launch’ button to enable the skill and allow triggered notifications to be sent. You can also save the skill as a draft by clicking on ‘Save Draft’ button and coming back to it later. Once launched, you can look at the stats of the skill through your dashboard. 1. Click on ‘Skills’ on the left and click on the title of the skill you want to analyze. 2. See all your stats for the skill. Ran: The number of shoppers who were targetted and saw the notification. Engaged: The number of shoppers who clicked on it. Influenced: The number of shoppers who made a purchase after clicking on the notification. Helped Drive: Amount of revenue the skill brought. These are different behaviors and conditions of your shopper or their activity that will enable the notification. Select the drop-down and click on the trigger/ condition you want to enable the push notification for. 2. Home Page: When a shopper is on the homepage. 3. 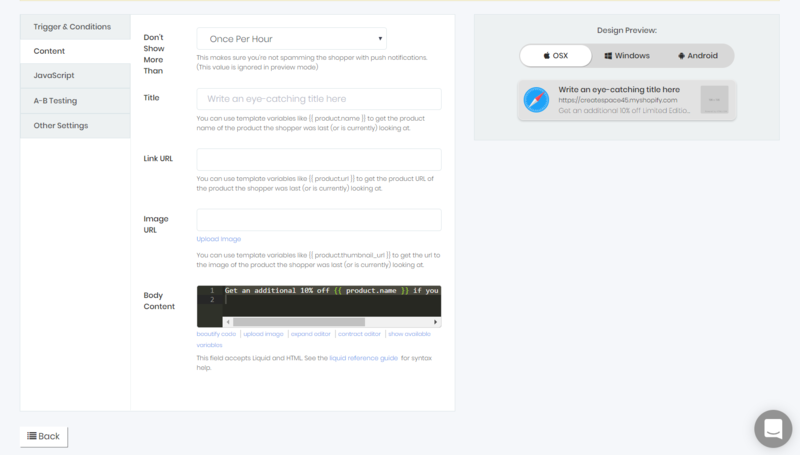 Any Product View Page: When a shopper goes to any product view page. 6. The Checkout: When a shopper is on the checkout page. 7. The Order Complete Page: When a shopper completes an order. 2. 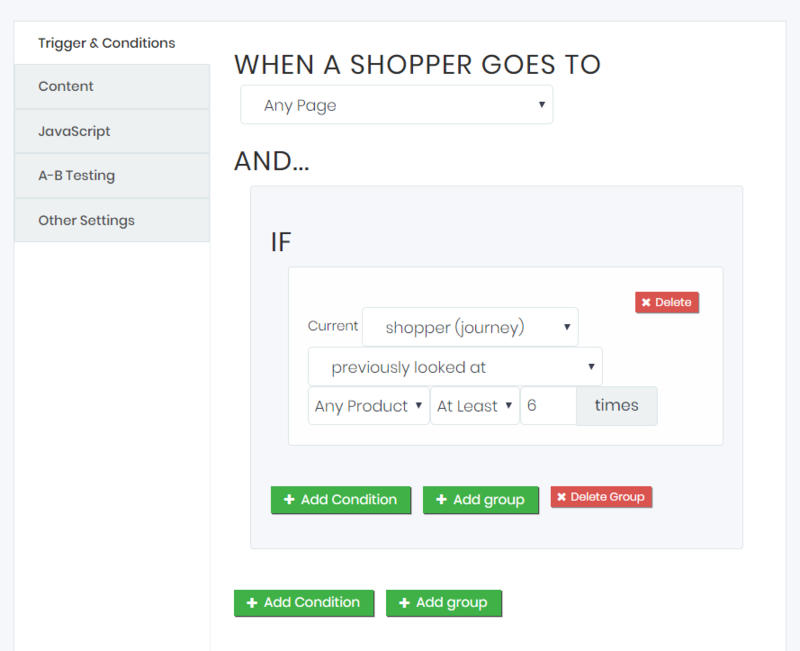 Shopper (location): Set up triggers based on the shopper’s country, city, state, and other location-based conditions. 3. 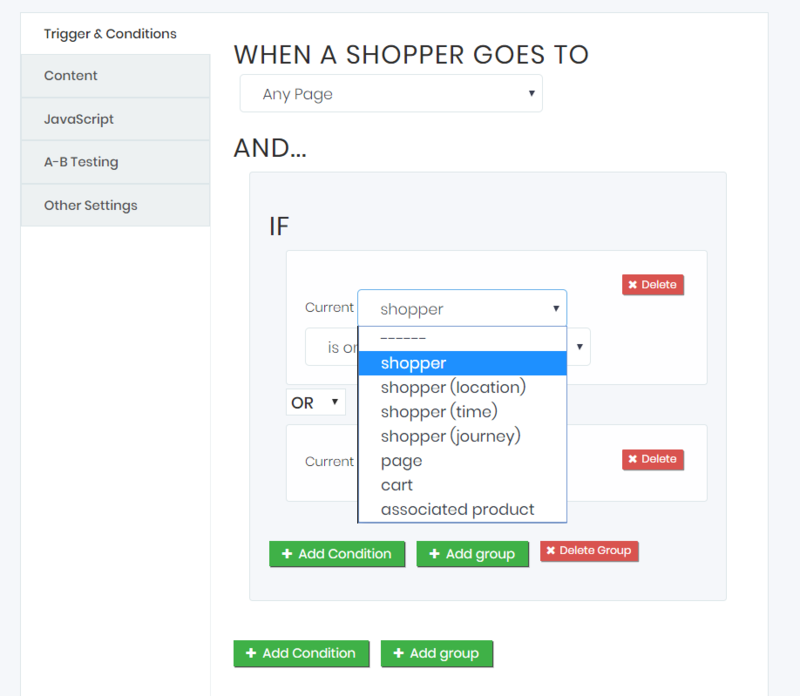 Shopper (time): Select conditions based on time spent on the store, time since they were first seen on the site, active time on a page, or inactive time on the page. 4. Shopper (journey): Select conditions based on what product they looked at, added to their cart or previously purchased. 5. Current page details: Set up triggers based on page details- page URL, title, or referral link. 6. Cart details: Select conditions based on total amount of cart, item count, total weight, product ID, or variant/option IDs. 7. Associated product: Set up triggers based on ID, tags, name/title of the product, or stock level. If you want to send trigger notifications to shoppers based out of the USA but only if they are inactive for a while, here’s what the condition will look like. This tab allows you to fill in the content of the push notification for the chosen trigger/condition. Click on the 'Content' tab and fill in the different fields to complete the automated notification. 1. Don't Show More Than: allows you to set the number of times one shopper will see the automated reminder. 2. Title: Fill in the title of your automated notification. 3. Link URL: The page you want the shopper to be taken to. 4. Image URL: Your store icon that will appear with your notification. 6. Design Preview: See how the notification will look for users on different devices. 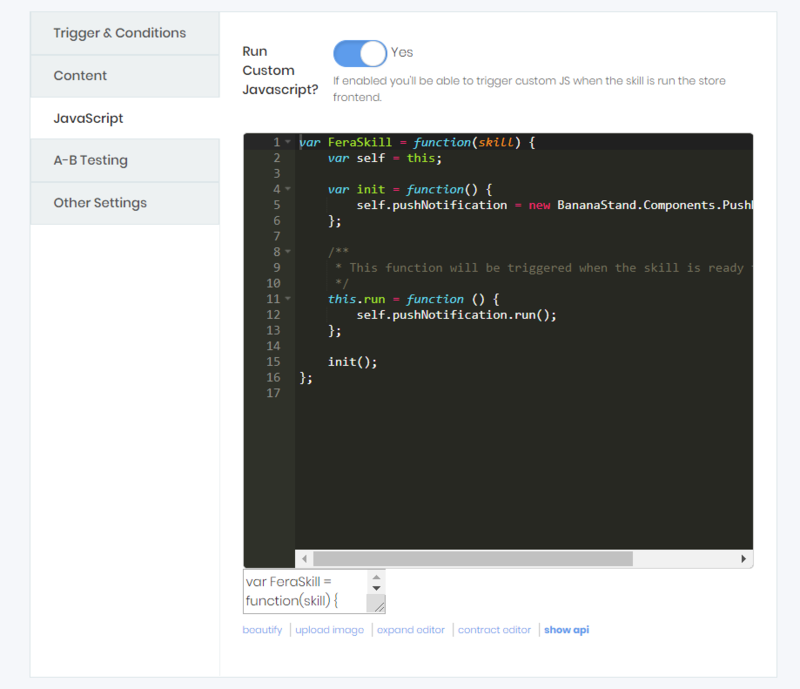 If you want to run your custom script, you can enable this and set your parameters within it. See how your shoppers are responding to your push notifications by setting up an A-B testing. By enabling it, you can learn whether the automated notification is bringing higher conversions or fewer. 1. Click on ‘A-B Testing’ tab and click on the slider to enable the feature. 2. Change the A-B testing distribution if you want to set the percentage of shoppers you want the skill to be shown to. A-B testing works best if the percentage is equally distributed. Here, you can name your campaign to help you manage it better. 2. Internal Description: Describe what this skill does to identify it better. 3. Internal Image: Set an image for the campaign. This image will be seen on your dashboard. 4. Set Schedule? : You can choose how long you want the campaign to run. 5. Priority: If you have multiple skills of the same type you'll want to set a number here that tells Fera.ai which skill to use if both are active for the current customer view. A lower number means it will take precedence. 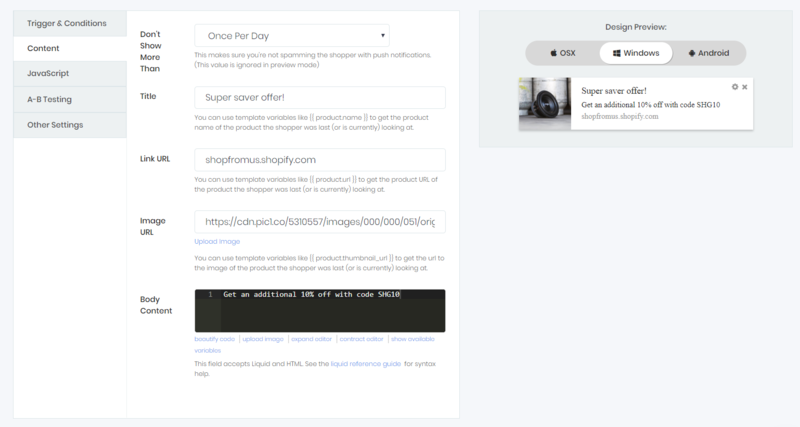 For example, you want to send notifications with a discount code to shoppers who are browsing your store but haven't purchased yet, you can set up an automated notification to further engage them. 2. Next, fill in the content of your push notification. 3. Name your campaign and fill in any other details you want. According to the screenshot, this campaign is running for 1 month, from 20 December to 20 January. 4. Click on ‘Skills’ and click on the ‘Inactive Shopper’ skill to find the stats and the number of shoppers engaged from this skill. If you have any queries or questions, reach out to our support team from the in-app chat.